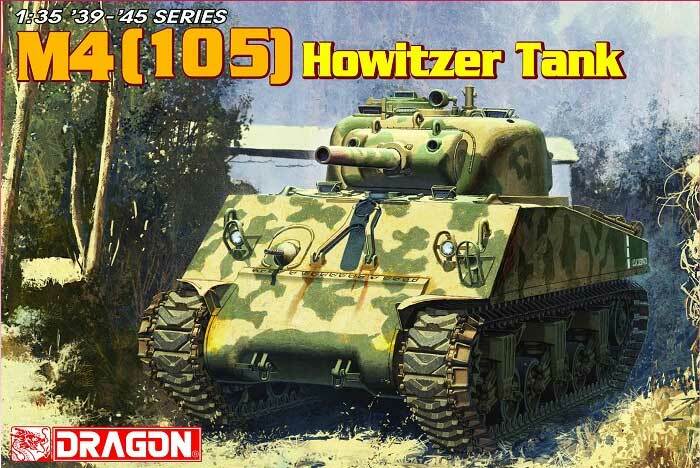 DML continues to plug the holes in the 1:35 scale plastic Sherman family by giving modellers an excellent M4 (105) Howitzer Tank which in this reviewer's opinion is one of their best Sherman kits yet. The M4 105 Assault was the last production variant of the radial engine M4 and the first to use the improved 47 degree single piece glacis hull with the large hatches. Over 1,640 and were manufactured between February 1944 and March 45 with both VVSS and HVSS suspensions. They were used by US, UK, Canadian, New Zealand, Polish and French forces in Europe and by the US Army in the Pacific. The 105mm armed Sherman was to provide armoured artillery support to the armoured formations and were typically employed in HQ formations as a support vehicle capable of direct and indirect fire. 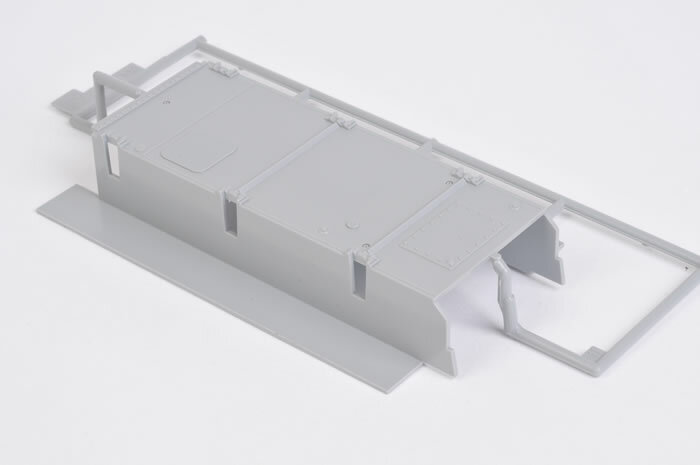 This release, like other DML VVSS Shermans, contains both the mid production bogies with the horizontal return roller support arm with spacers and the late production angled return roller arms. 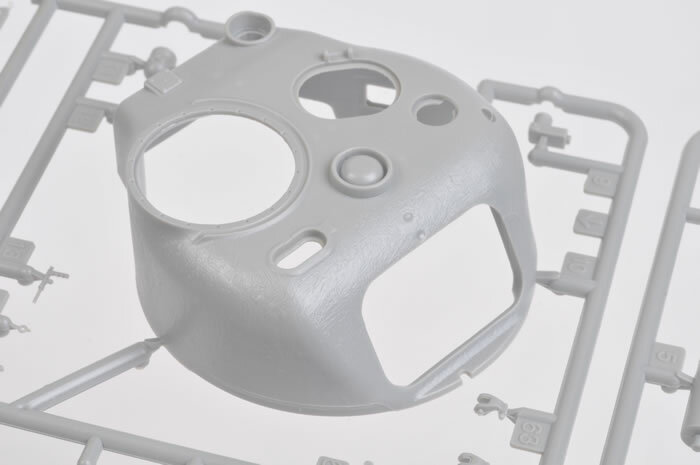 The later ones are the correct option for this kit along with the pressed steel wheels from Sprue V. The instructions give you the option, but I have never seen the mid production wheels on an M4 105. 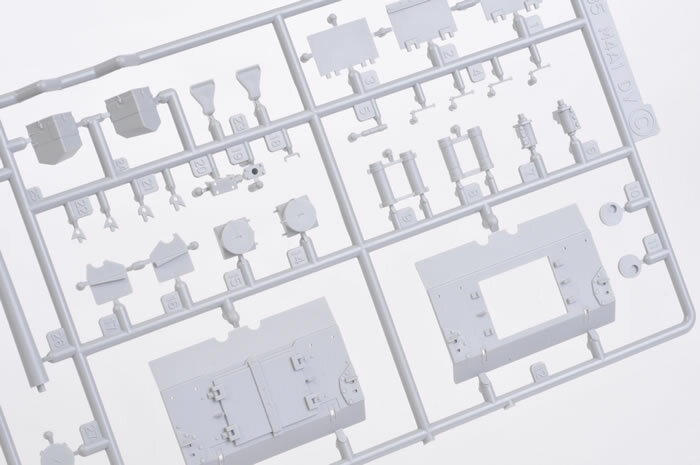 Other options in the kit are the Commander’s cupolas with a split hatch and all round vision cupola included. Check your references as to which type you require. 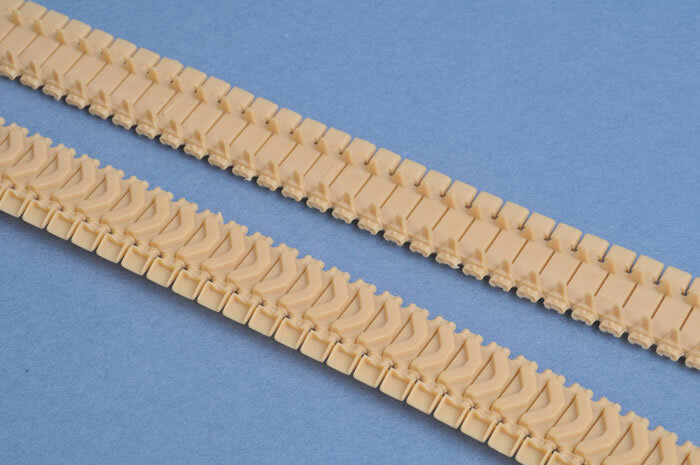 The tracks are the now familiar DS one piece run, in this case representing T48 Rubber Chevron type with extended end connectors fitted. I am a big fan of the DS track but I have frequently had to shorten it by two links. Thankfully this is easy due to the glueable nature of the DS track. I suggest drilling and pinning it for greater strength. 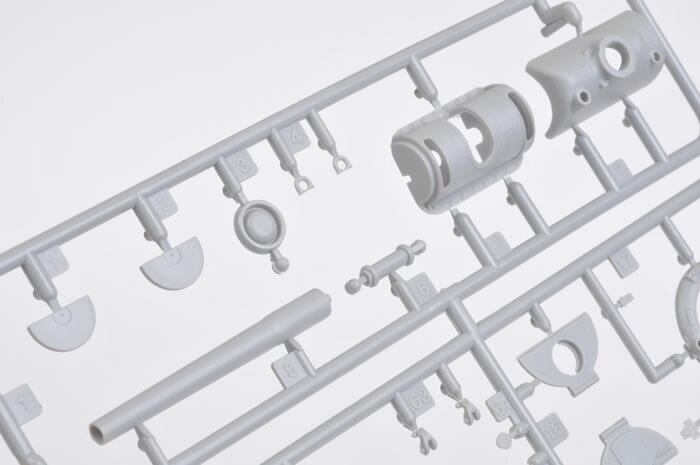 In previous releases, DML has offered two track sets where extended end connectors are an option. They have sadly chosen to only include the EEC option here which is baffling considering that two marking options are Normandy period vehicles which did not have EECs. 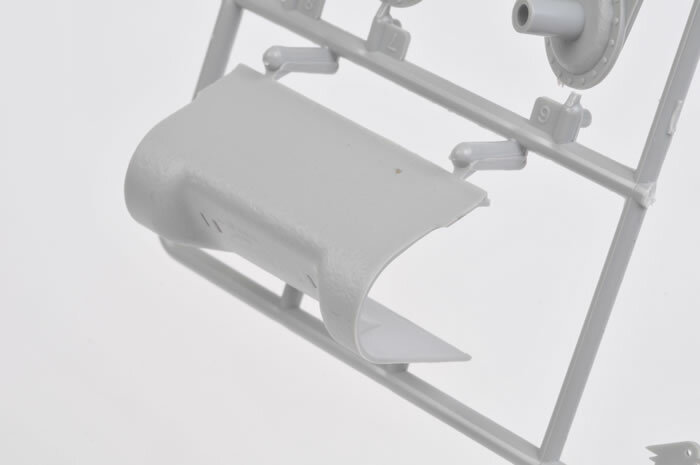 DML has modified their earlier adjustable rear idler mounts which is disappointing as it could previously be used to ensure a snug tight run of track required on the Sherman. HQ Company 32 Armd Regt Belgium 1945 in Whitewash. 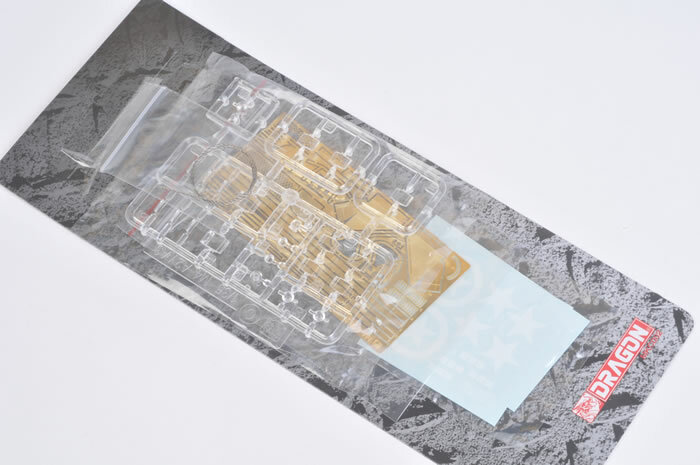 Additionally, DML provide their now familiar US Stencil sheet which has multiple alpha numeric characters, triangles and U.S.A markings to allow you to depict another vehicle. I am personally disappointed that they couldn’t have offered a British, Polish or French option as well as these are all well documented in current publications. Regardless of my nitpicks I feel this is one of DML’s best Sherman kits of a very important Allied subject. DML’s researchers have really done a great job on this one. 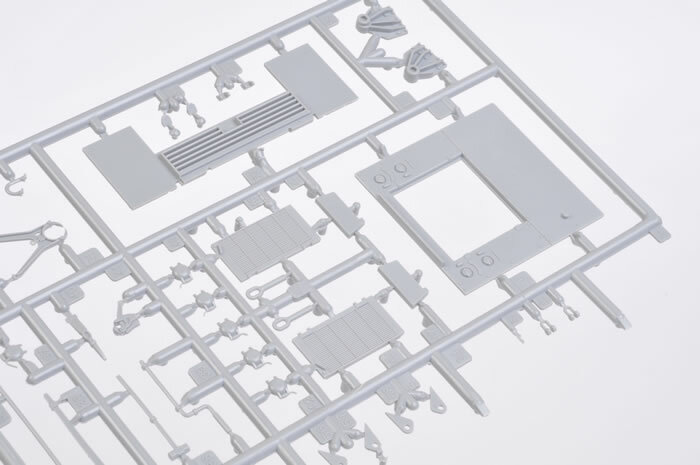 The detail is outstanding and it will build into a great looking accurate M4 105 Assault Gun. I thoroughly recommend this kit and have already bought multiple examples.